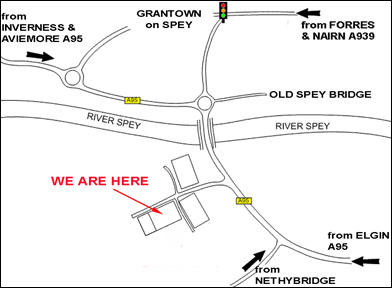 When arriving in Grantown take the 2nd exit at the roundabout – follow signs for Elgin A95. At the next roundabout take the 3rd exit. Once over the bridge turn right into the Industrial Estate. Follow the road to the top of the hill and you will see our showroom on the right hand side. Just before you arrive in Grantown on Spey you will see the signs for the Achnagonalin Industrial Estate on your left hand side. Follow the road to the top of the hill and you will see our showroom on the right hand side.